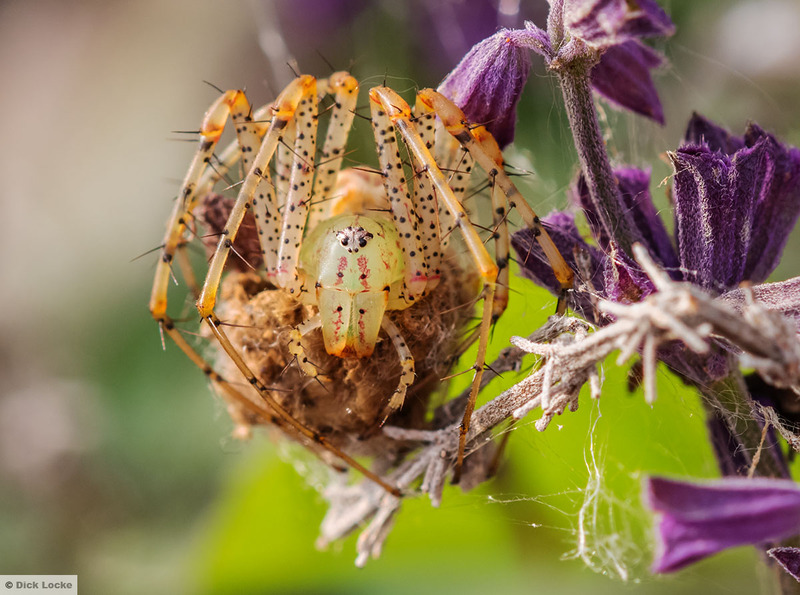 This page features house spiders, and spiders found around the house in Texas. My primary spider page is here. Lynx Spider - Blending In! This guy is easy to miss as he's very close in color to the foliage. I found him dining on an assassin bug as shown on the "spiders gotta eat" page. I happened upon this green spider while I was chasing bees. The eyes give the impression the spider is trying to intimidate me. Nikon D810A, 200mm f4 lens at f10, 1/800s, ISO 1250. Click on the thumbnail below to see what the red, white, and green markings on its back looked like. 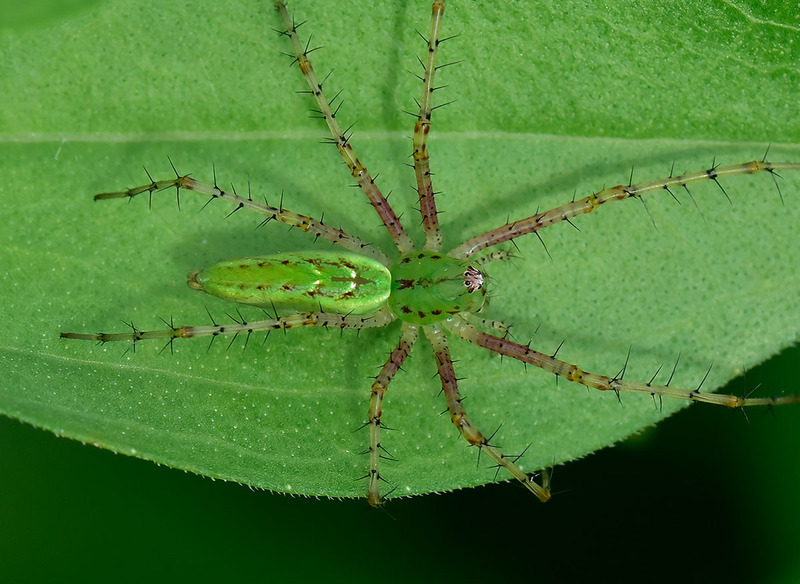 There's another Lynx Spider image towards the bottom of this page. Here's the bugguide.net pic. This gal was hanging out on the front door. I used her to practice my macro techniques included use of the Nikon D810A's electronic front curtain, mirror-up, and delayed exposure features. This was 1/20s at f9, ISO 640, with the 200mm f4 lens. 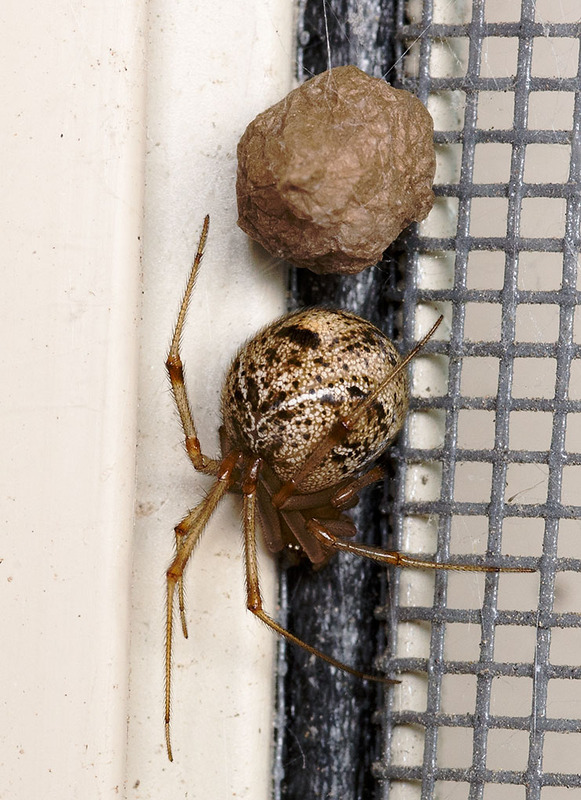 This guy (probably a gal, I expect that's an egg sac) was hanging out on the back porch late August 2014. Tripod mounted Nikon D610 camera with the 105mm f2.8 macro lens at f22 and 1/20s ISO 800. As you can tell by the size of the window screen wires, this guy is pretty small! Many thanks again to Gil who kindly provided me with the following ID & info: Your photo appears to show a Common House Spider (Achaearanea tepidariorum). 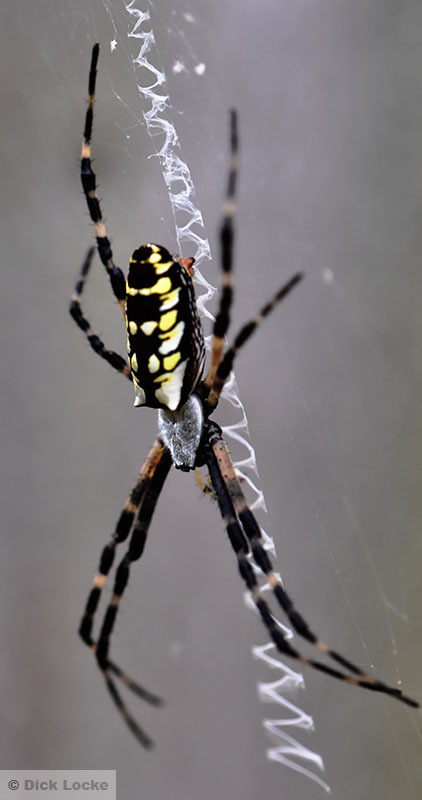 It is a harmless spider in the same family--Theridiidae, the Cob Weavers----as the Black Widow. A few days after the picture above it appeared there was some sort of dust near the spider. But, looking more closely, there were a bunch of tiny little spiders. 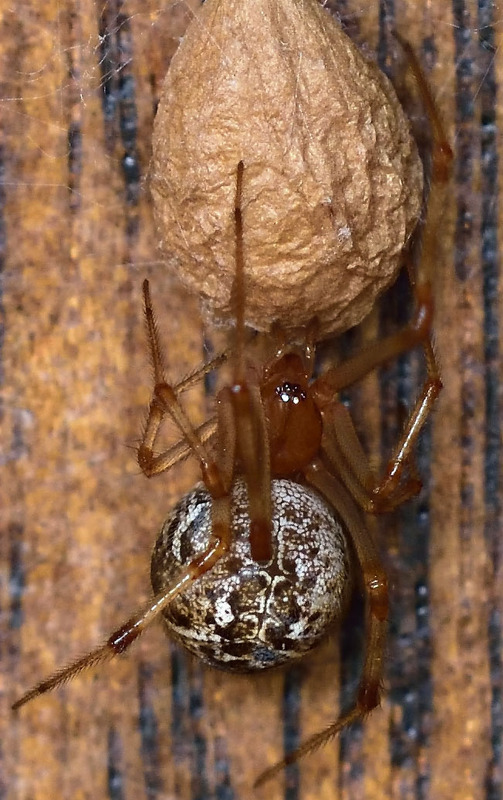 I guess that was an egg sac! Again, look at the screen wires for a size scale. 1/4 second at f22, ISO 400, same equipment as above. 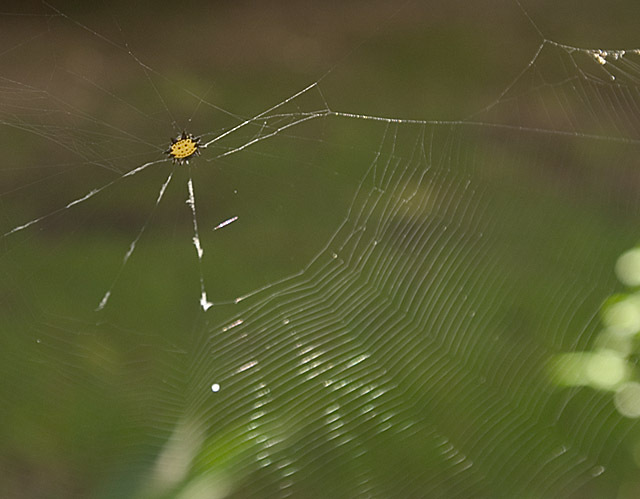 This is some sort of "Writing Spider" from the backyard, 6/7/2015. Nikon D750 & Nikkor 200mm f4 micro (macro) lens; handheld at f6.3, 1/1000s, ISO 1000. 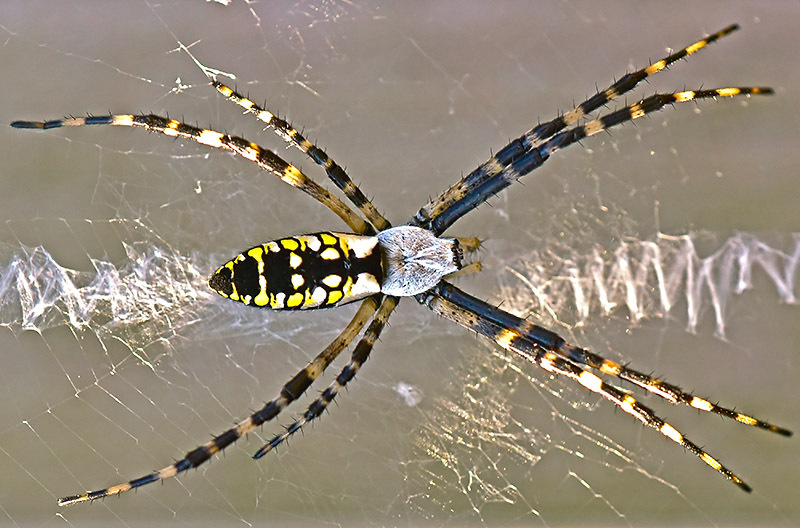 More Argiope pictures are on my main spider page. The tarantula picture, and a few other spider pictures, have moved to this page. 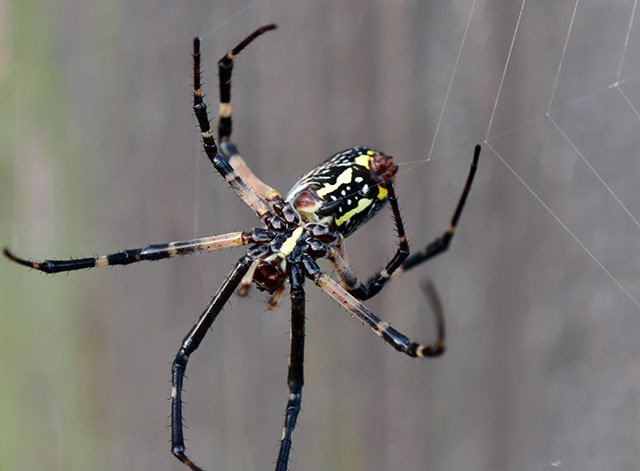 This gal (an Argiope, more pictures on this page) took up residence in the back yard in the summer of 2015. Nikon D810a, 200mm f4 lens, 1/640s, f5.6, ISO 3200! This page has some information about Argiopes.